I finally got to play battlestation last night. It kind of reminded me of star wars battlefront 2017 due to having 3 battle phases & ability to have 2 - 3 heroes at once on the battlefield. Noticed the other dlc playlists allow that as well lol. Anyway my first game was actually pretty amazing (played the empire) the first phase went by quickly the ship objectives got taken out just like that lol but second phase was amazing. The rebel players had like 16 minutes & I am like oh great we won't be able to hold them out for 16 minutes especially with how the first phase went. We managed to defend R2D2 in the first/starting room for 5 minutes. Then right when it hit 10 minutes R2-D2 was basically at the objective. I was like nooooo my first time playing this game mode & lost. Next thing you know R2-D2 stops near the objective. We manage to then hold out for the remaining 10 minutes & won lol. Next game was battlestation again this time was playing as the rebels. Made it to all 3 phases with only a few seconds to spare in second phase. Trenchrun got to say is amazing but only complaint with it was it was nothing but open space & got shot down quickly unless you where in the trenches, though never was one of the people needing to hit every checkpoint but flew into the trenches anyway & could tell it was hard to navigate lol. Anyway battlestation was pretty fun truthfully. Wish it was played a lot more truthfully had a blast, got achievements & completed the hutt contract for it. Just need games on bespin to defend the generators for the hutt contract lol. SWBF2015 is pretty great. I preferred Outer Rim, Bespin, and Rogue One DLC to Battlestation. I did play it from time to time and it was pretty good. The game play, game modes, , fewer bugs, and amount of content put into that game at the start puts this game to shame. 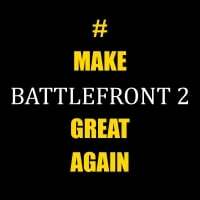 Really the only part that is better in Battlefront 2 is that we have predefined classes which make game play more realistic to Star Wars universe, more heros, better star fighter game play which most people don't take advantage of, and more realistic looking maps and characters......the rest is much worse than 2015.